On the Main Line: Shadal series #12 - why translations of translations sometimes don't work. Shadal series #12 - why translations of translations sometimes don't work. Vargon's footnote indicates: that "This letter is cited in A. Kahana, "Samuel David Luzzatto, His Life and Literary Opus" [Heb. ], Ha-Shiloah 4 (1898-1899), 60. Indeed it is. Before I get to it, it is worth analyzing what the content of this paragraph seems to be saying. It quotes Shadal as saying that he has another purpose in mind for becoming a reputable critical scholar. It is to defend Judaism. Without having cultivated a stellar scholarly reputation, people would dismiss his views because he is "a pious man." We are immediately struck by something. Kahana does not indicate where this letter appears; it is in fact excerpted from a longer letter, but we cannot read it as it was originally printed without knowing where. The second thing is that Kahana did not indicate that he actually translated it from Italian, although it is only after locating the letter that we realize that. Fortunately I was able to discover the letter in Epistolario, the collected Italian, French and Latin letters of Shadal. It is letter number CXL, on pp. 207 - 209, to Isaac Samuel Reggio, dated sep. 2, 1836. Ho oltracciò un'altra considerazione, ed è che se il mio nome acquista mai qualche peso dal lato scientifico, io potrò un giorno con qualche speranza di buon esito prender la difesa del nostro Palladio; conciossiachè quest'è una causa che abbisogna di patrocinatori di qualche grido: altrimenti si fa presto a dire: questi è un fanatico. I want to focus on the final words. Kahana writes that Shadal says he is careful to cultivate a scholarly reputation, as indeed he had, otherwise his words in defense of the faith would be dismissed by those saying he is an "ish aduk." Vargon translated this as "a pious man." As we can see, Shadal's original words were "un fanatico," which means in Italian what it means in English: a fanatic. Is there a difference between pious and fanatic? More importantly, in the 19th century would those whom he made sure that he impressed have dismissed a scholar for being "pious" or rather for being a "fanatic?" Finally, does "ish aduk" properly convey the meaning of "un fanatico," and is "a pious man" what he intended after all? I feel that Kahana did translate responsibly, and Vargon translated Kahana responsibly. The trouble is that Vargon's translation is too far removed from the original - this is not his fault - to convey the actual intent of what Shadal meant. "A fanatic," or "a zealot" is not a true synonym for "a pious man." Many Bible scholars of the 19th century were pious men and were certainly part of the scholarly discourse of Bible studies. The term 'aduk' is a rabbinic Hebrew word for a scrupulously observant person, and we can readily see what it meant by the other, more literal meanings of the term: to hold or to grasp (see, e.g., Metzia 7b). A person who is holding, therefore, is quite literally a pious person. By the 19th century the term had indeed taken on a flavor of fanaticism, which of course has a negative connotation to most people. Thus Kahana was correct to use this term. As far as I can think, his only alternative would have been 'kannai,' but I think that its connotation of zealousness would have made it too imprecise. By that token, since Vargon was translating 'ish aduk' it was reasonable for him to translate it merely as 'a pious person.' I do not fault him for not grasping that something more was intended. But as we can see, going back to the original, it isn't what Shadal wrote. In any case, the original letter we are discussing is interesting in its own right. 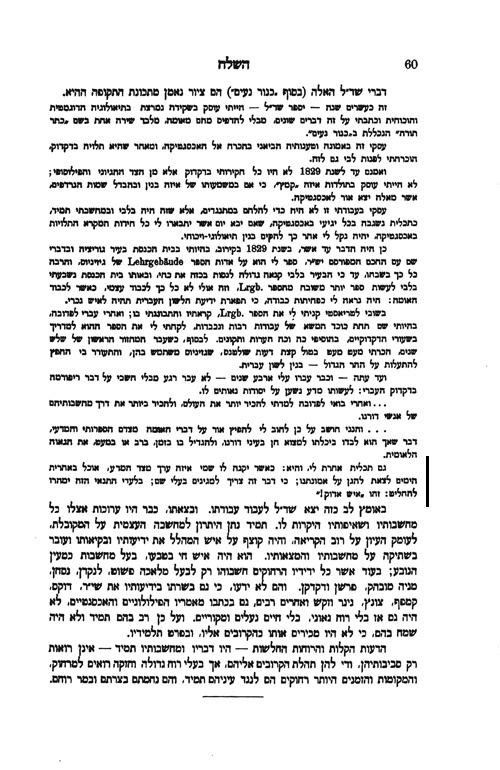 Shadal is writing to Reggio, who had been responsible for his employment as a teacher at the Rabbinical Seminary of Padua and at one time a sort of mentor to him, and explaining why it is that he had recently wrote and published his Introduction to a Grammar of the Hebrew Language (Ital.) for the benefit of his students. After spending the 1820s studying Hebrew in his own way, Reggio himself had referred him to a book by Gesenius, which absolutely revolutionized Shadal's own thinking about Hebrew. This was in 1829 and was the first complete book in German he ever read. When he began teaching that year, it was with this book. But over the next few years he began to make new discoveries and came up with a scholarly approach to Hebrew that differed in many respects from Gesenius, then the most famous Hebrew scholar in Europe (this is a fact; Gesenius, for his part, reputedly complimented Shadal by referring to him as Italy's greatest Orientalist). 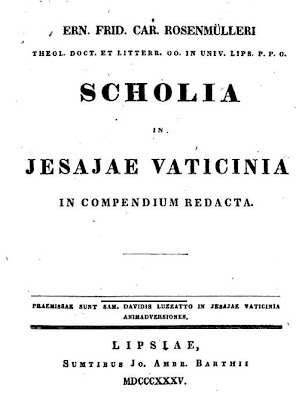 Furthermore, Shadal, continues, he was able to cultivate a good scholarly reputation when the Bible scholar Rosenmueller included his notes on Isaiah as part of his own Scholia in Jesajae Vaticinia. Why, he explains to Reggio, is he working on these works of scholarship? After all, his job is to teach future Italian rabbis. It is so that he can raise the prestige of Judaism among outsiders. Furthermore, by enhancing his own scholarly reputation he also is able to enter his scholarly views into the mainstream of Bible scholarship and in so doing he is enabled to defend the faith of Judaism. If he had no reputation then his views could be easily dismissed, saying he is "a fanatic." Interestingly, as the years went by Shadal seemed to care less about his reputation, probably because he had already established it (nearly every mid-19th century article on Biblical Aramaic or the Targums refer to his Ohev Ger, for example). Although he adhered to real scholarly standards: for example, in Kerem Hemed 3 (1838) he was involved in a deep polemic with Abraham Geiger over the latter's interpretation of a Mishnah in Eduyot which is fundamental to the question of rabbinic authority. Without getting into the details, Geiger understands the Mishnah to say that minority opinions are recorded so that a contemporary rabbinic court, greater in wisdom and number, can overrule a court and adopt a minority viewpoint (preserving the minority viewpoint lets it be aware of the viewpoint, which it can adopt). Interestingly, while this interpretation works for Geiger, who was trying to reform Judaism, it also worked for Shadal, who was not trying to reform Judaism, but did argue that halacha is inherently flexible, and halachic rigidity is a mistake, and foreign to the spirit of the Talmud. However, Shadal could not make it fit the words of the Mishnah, and he adopted Maimonides' interpretation that it referred to courts of different generations, not contemporary courts - who have no right to overrule one another. He writes that he liked Geiger's interpretation, but - עם כל זה רואה אנכי שאין כוונת התנא לומר כך, וחלילה לנו לפרש מאחר שלא מדעת מי שאמרו / "Nevertheless I see that this isn't the intention of the Tanna to say this. Far be it for us to explain something other than the way the speaker intended." And this may well be said to be his credo. The self-sacrifice of Jewish inquirers in the Middle Ages, who in the midst of unspeakable privations and sufferings had occupied themselves in the cultivation of their minds, Luzzatto also manifested as a model for the younger generation. During his whole life, and although he enjoyed European fame, Luzzatto and his family suffered through poverty. Privations, however, did not hinder him from increasing his knowledge with endurance all the more heroic because not publicly displayed. To be poor in Poland, as was the case with Rapoport and Erter, was not so distressing as to be poor in Italy, because in the former, requirements were slight, and contentment on the smallest means was almost universal; besides, generous, wealthy men saved the men of science from starvation. But in Italy, where even the middle class craved comfortable living, and where indifference to knowledge among the Jews had reached a high pitch, it is matter for great surprise that Luzzatto could find, amidst his struggles for daily bread, the peace and cheerfulness necessary to accomplish so much for the promotion of Jewish science. At every discovery, however trifling, Luzzatto felt childlike pleasure, which appears strange to an onlooker: it was the self created recreation of the martyr, which for a moment causes gnawing pain to be forgotten. This in turn reminded me of the poet Umbert Saba, Shadal's great-nephew, who wrote that Shadal was so poor that he mostly ate a single dish - panada, which is made of old bread, olive oil and bay leaves. This, according to family tradition, perfectly satisfied him. But not his wife, whom he alas provided for but little. Getting back to Graetz, in a letter which I have by now quoted several times, Shadal was asked if it might not be a good idea to print his Bible commentaries with square Hebrew letters, rather than Rashi, to make it easier for Christians to read. Shadal replied that he doesn't write Bible commentaries for Christians and truly he could not care less if a Christian interprets "alma" as "virgin." He does not engage in religious polemics; his only purpose is to teach his fellow Jews. Writing to Franz Delitzsch several years later, he reiterated this sentiment, that he cares not for the difference of opinion in interpreting 'alma.' (link). 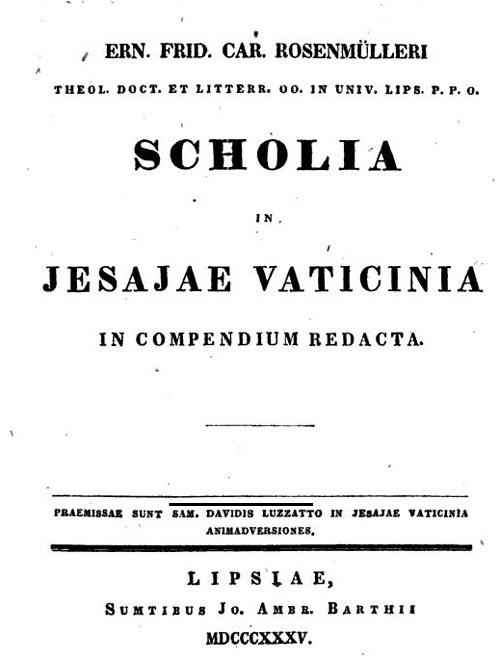 Thus we see that, perhaps, what Shadal cared for in 1836 - scholarly reputation in the world of European scholarship - he seemed to care for no more in 1856. Great post. I spotted another translation problem: where Kahana has Shadal saying that he felt called upon to defend "our faith" (emunateinu), Shadal's original says "nostro Palladio." Palladio is the Italian for "Palladium," which has been defined as a "safeguard, especially one viewed as a guarantee of the integrity of social institutions" (example: "the Bill of Rights, palladium of American civil liberties"), but the original Palladium was a statute of Pallas Athena (you remember her from Poe's "The Raven") that was believed to ensure the safety of Troy. Oy vey! One can hardly blame Kahana for going the route he did, considering his own audience, but a great deal is lost in translation -- among other things, Shadal's familiarity with classical (even pagan) allusions and his comfort with using such references in a letter to a fellow Italian Jew. Speaking of classical allusions, there is a place in Epistolario where he registers surprise that the posek R. Yishmael Kohen refers to Ulysses in a poem he had seen. Thinking about it, "החרדים המה הרוב" for "De ortodox are de majority" is pretty darned funny. Would you say that we ought to be very careful about reading the english translations of books like "Chovos Halevavos" which are usually english translations from the Hebrew translations of the original Arabic? I don't know with firsthand knowledge of the original language, but the answer is, probably. It may be better than nothing, but that is no insurance against real misunderstandings.